Caroline, a 15-year-old girl at Nganoine Primary School, was the warmest of all the kids our validation team visited this period. Unfortunately, we could not find her at her school when we visited, as she had already been sent home for unpaid school fees. We then asked for directions and headed to her home, where she, her mother, and brother all reside. Caroline’s warm personality asserted itself as soon as she saw us on her doorstep; she was delighted to see us and immediately welcomed us with a traditional Kenyan cup of tea. We helped her clear the small fee to get back to school, then sat down with Caroline and her mother for an interview. We learned that she is the last born to a family of 6 kids. Unfortunately, all of her older siblings were either unable to join or stay in secondary school. To make matters worse, Catherine’s mother fell sick and has been on medication ever since, which has increase the cost of living for the family. Despite all these challenges, Caroline managed a decent 318/500 points on her most recent examination, and dreams of working in a community-service focused career in the future. She also loves singing and is part of her local church choir. 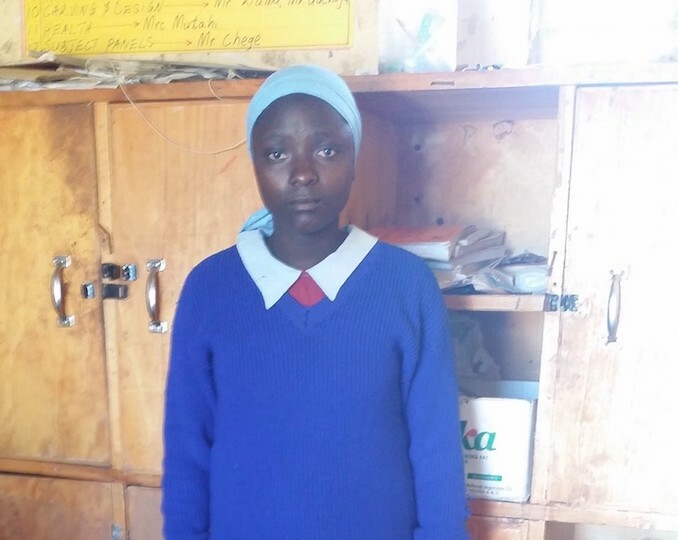 She is optimistic that she will get help to pursue her secondary school education next year, and aspires to earn a 340 on her upcoming KCPE examination. Help Caroline achieve all her goals by sponsoring her education today!